Well first for people who don’t know what Hama beads also known as fuse or picture beads, As Hams is a trademark of one manufacturer. These are small beads that you put onto plastic pegs boards and once you have done your design you place special ironing paper on top of your creation then using a iron with steam off iron your design, this then fuses the beads together, let it cool for few minutes then you have your creation. 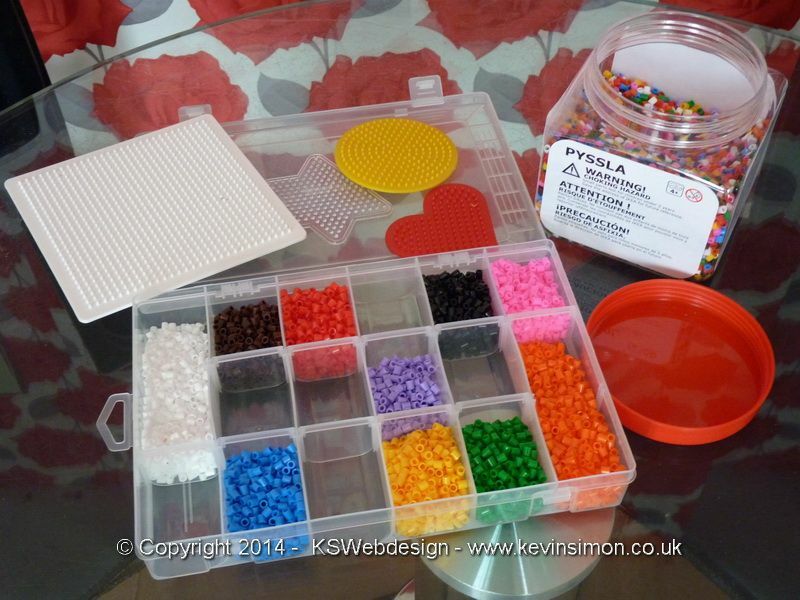 If you are new to this the cheapest way to get the beads and boards is from IKEA, as they do a tub with approximately 11000 beads in ten colours for just £5, the colours are: white, brown, blue, red, purple, yellow, black, green, pink and orange. They also sell the boards a set of four will cost £1.30 this includes large square board 29 x 29, small square board 18 x 18, circle board approximately 16 across, heart shaped board approximately 12 across the pack also comes with a few sheets of the ironing paper. These are great value as the official Hamas beads for this would cost over £20. You are restricted a bit with your colour choice, though from hobby supply shops or even ebay you can get around 1000 beads in a individual colour for around £2. We find with the mixed colour boxes of beads it is best to separate out colours before hand as this makes it easier for when doing your design. The best way to do this is buy one of the storage containers that have several compartments in, these are available for a few pounds from discount retailers. The best way we found to sort them was to get a handful put them on the floor, though could do on table but easier to pick up from the pile of the carpet. Then start picking up and placing in your hand one colour then putting into your storage box. When doing your design or creation we found using tweezers was the best way to pick them up to put on the peg board, as most tweezers are small enough to pick the beads up from the inside. I would recommended when ironing to get good ironing paper as the paper that come with the boards from IKEA are not that great, though at a push if you haven’t got the ironing paper you can use grease proof paper at a push. Also make sure when ironing that the steam is turned off on your iron and iron firmly but not too hard in small circular movements. I like to display the creations with the un-ironed side showing as thinks its gives a better effect like pixel art that is done now on computers and how I used to design graphics on old 8bit and 16bit computers. If you want your design to be more ridage you could iron the other side by just removing your design of the peg board after you have ironed that side and then on flat surface iron the other side for strength. If you want ideas for designs you can buy books, but the best way is either search for images on Google, Bing, pinintrest etc or just do a normal net search and you will find people showing their creations and sometimes full instructions. Though from a image you can normally work it out even the 3d designs, like the clown below that the ex did just from looking at pictures. So use images for ideas or just let your creative side take over I did a little scene of a house and tree, with sky and clouds but it broke up before got photo of it. The flat designs are pretty easy to do and if bit more adventurous try doing some of the 3d designs. Below are some of the designs we have done, though not all of them as some were blue-tacked to the fridge and when I tried to remove them they broke. But as you can see from below some nice designs so far. As I’m into technology I did a old 3.5″ floppy disk I use these as coasters for my drink when working on the computer. I also did mouse pointers which I think looks good though I’m a bit of a geek when it comes to things like that, my daughter did the Pokemon balls and heart shape ones. The 3d clown was done by the ex, there is a nice largish 3d design of the tardis that I want to do but need a different shade of blue, so once get more beads will set myself a challenge to do that. I do find doing designs very relaxing though can be a pain sometimes when you are just putting a bead in a knock the others in your design. As we do more designs I will update this page with more images and tips so stay tuned for updates.